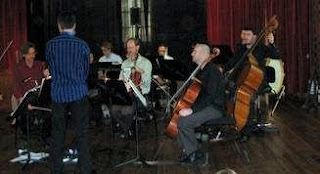 There can be no doubting the dedication and enthusiasm of the musicians from the Queensland Symphony Orchestra (QSO). Rachel Smith, Principal first violin with the QSO, has directed the Stradbroke Chamber Music Festival since its inauguration in 2007. This year, together with 12 or so of her fellow players plus other musicians, she again gave up her QSO 'break' to spend a week working hard on North Stradbroke Island (to say nothing of the many hours of organisation!). Sparkling... The 2010 festival was a treat! While most visitors to Straddie are there for a holiday, these musicians rehearsed, presented four demanding concerts and held classes for local musicians. There certainly wasn’t much time for sightseeing! I have to confess to being a committed SCMF 'groupie'. I look forward to travelling 'overseas' for a week or so of R&R and taking in the sea air, the relaxed lifestyle and hospitality of the island and soaking up the beautiful music. The variety was amazing. We had gems such as the sparkling Mendelssohn string quartet Op.44, the impassioned Mozart String Quintet K.174, the uplifting Brahms Clarinet Quintet Op.115 and Schubert’s heavenly, but at times troubled, String Quintet D956. The perky wind quintet 'Summer Music' by Samuel Barber provided the pallet-cleansing sorbet between courses in the first concert on the Friday night. Then followed the dark and brooding String Sextet, 'Transfigured Night', by Schoenberg. Concert 3 was aimed at the youngsters who came in great numbers (and in great voice!!) to the Dunwich Community Hall. Col Cunnington narrated the story of Peter and the Wolf , music by Prokofiev, which was well received. Cellist Louise King successfully ‘stopped the show’ for a while with a clearly audible ‘wow’ after the timpani ‘rifle shots’. Australian composers Stanhope, Sculthorpe and Hopkins provided the remainder of the program with several beautiful cello solos by Louise (wow) King and a string quartet with didgeridoo. 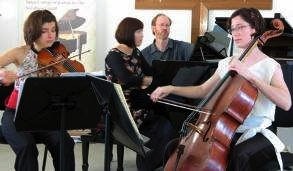 Concert 4 on Sunday morning featured the highly-regarded Freshwater (Piano) Trio from Melbourne. The program was delightful with piano trios by Beethoven and Brahms and a little ‘sorbet’ in between by Australian composer Gordon Kerry. The tangy dessert items were amazing arrangements of piano solos by Chopin and Schumann for the trio by Jazz musician and composer Joe Chindamo. The final concert was a special dedication to the memory of Stradbroke identity and Festival inspiration Jani Haenke. The Schubert String Quintet brought the Festival to a most satisfying conclusion. I can’t wait to see what Festival No. 4 brings. But I know I’ll be there! !